Disney Girl: Challenge #20! Emboss Resist!!! Are you ready for *Challenge #20 over at Scrapbook Blessings Club? This challenge is ANYTHING GOES with the Design Team spotlighting the technique "Emboss Resist". To see the video tutorial that inspired the Design Team and also all the wonderful things that the Design Team created head on over here to Scrapbook Blessings Club. A BIG thanks to the sponsor for this challenge, Pinque Peacock. They will be giving the challenge winner a a Crafty Kit of choice. All card stock, bakers twine, flowers, brads and Mickeys are from my stash. VersaMark Watermark stamp pad and clear embossing powder. Minnie Mouse was cut at four inches using the Cricut cartidge Mickey and Friends. My Tip to you: Go through your craft supplies and dig out something that you have not used in forever. You will once again be reminded of the fun it was when you first bought it. 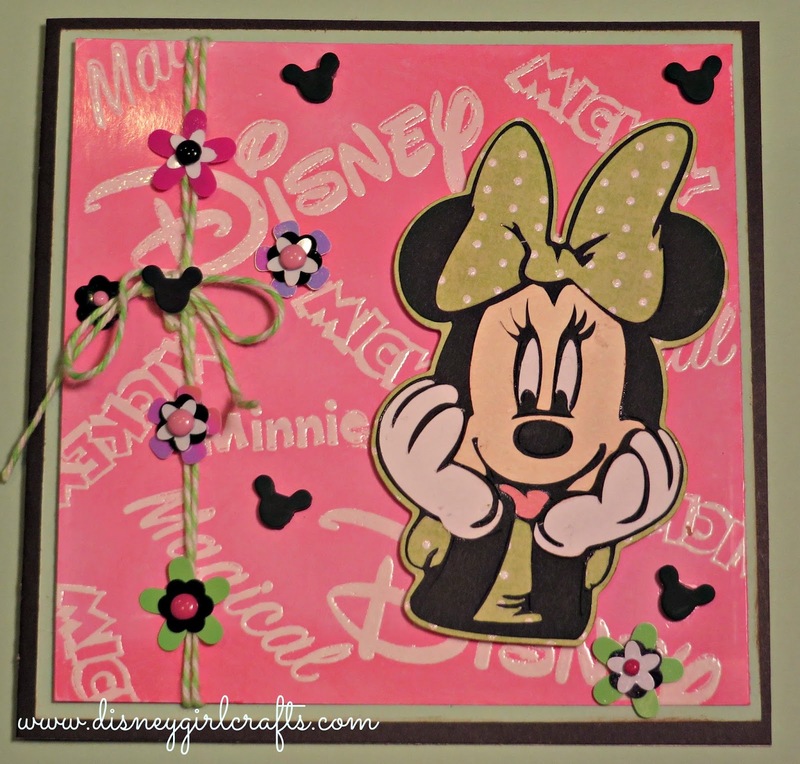 I also have to add that Miss Minnie Mouse on this card is one of my all time favorite cuts. I tend to use her a lot. To see another card that I made using the same Minnie go here. I hope that you will head on over to Scrapbook Blessings Club and link up. Also join us on Facebook by going here. I look forward to seeing what you create. Thanks so much for stopping by and have a magical day!!! Cute! I like your Minnie. Great use of the stamps. This is so cute. So glad that you were able to "get your Disney" on again. I'm with you, I have so many products/tools that I have neglected for a really long time and it's great to revisit them and put them to great use again. BTW, my daughter lives pretty close to Disneyland and able to go all the time. I don't think they will mind about the increase either. They just love Disney too.